An experimental project was developed for the design market during Tallinn Music Week festival. A powerful speaker was located as the printing bed and different beats, music and rhytms were played during the printing process. 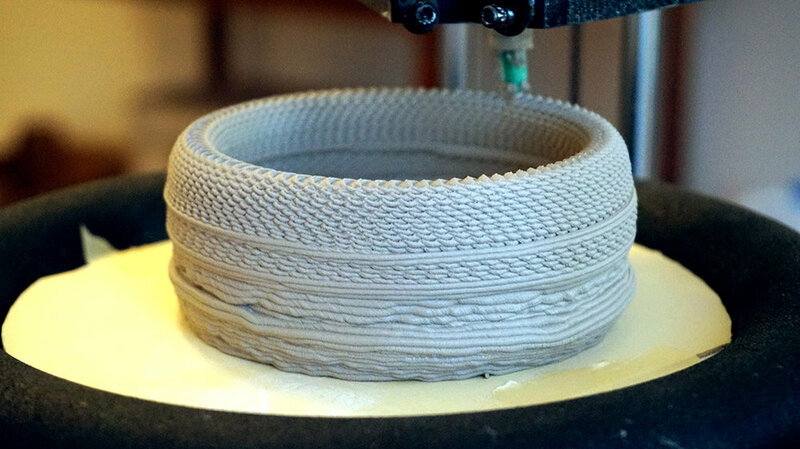 The vibrations resulted in distortions in the texture of the printed object. A small experimental project in collaboration with UTOPIA blu. 3D printed snowflakes that are created using only one continuous line. The use of ceramics in architecture is quite limited. Mostly it’s used as a practical surface finish in sanitary rooms, but also in more delicate interiors if the tiles are made more complex and decorative. Nowadays all tiles are usually produced in the same shape, the more variation of shapes in the tiles - the more expensive the project becomes. In that context the complexity is achieved by combining variations of 2-4 different tile shapes. 3D printing ceramics is a very young and rapidly developing area, in collaboration with Protoinvent OÜ we are one of the first to build those machines in the Baltics. So, as a demonstration of the possibilities of 3D-printing ceramics, all tiles in our installation are unique. Variation doesn’t come at a cost. The idea was to use the ceramics 3D-printing machines that Protoinvent have built and produce an installation of ceramic tiles in the Culture Cauldron Hall. Design idea is a system of tiles that organically change their shape and transmit light.